DM Scuba use lots of different types of DPV, we have Torpedo 3500s for Open Water and we use Bladefish 5000s, Seadoo GTI and VS Turbos in the pool! We have 20 DPVs so plenty to go around! We utilise these during our pool parties, adults and children alike love whizzing around effortlessly like James Bond! For more info on our pool parties, click here. Fun? Underwater scooters (DPVs) are a blast! It’s all fun. • Diver propulsion vehicle dive planning organisation, procedures, techniques, problems and hazards, which includes the safe use and control of a DPV, care and maintenance. 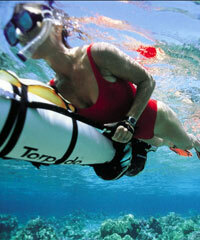 Normal Scuba gear in Open Water and minimally Snorkel, mask and fins in the pool. Number of Dives: Two open water dives. 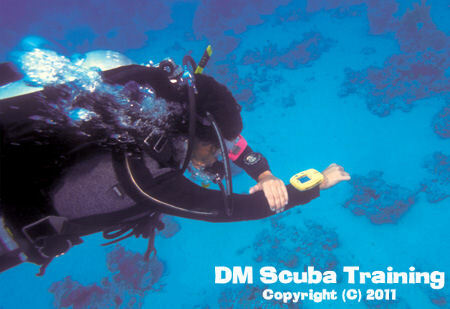 Certification counts toward the PADI Master Scuba Diver rating. DPVs can come in handy when wreck diving because they let you tour more of the wreck, plus reduce your air consumption. You may want to consider the PADI Wreck Diver course while working your way to Master Scuba Diver. Learn to Dive in a Dry Suit! - Click on the photo to learn more! Learn how to navigate properly! - Click on the photo to learn more!